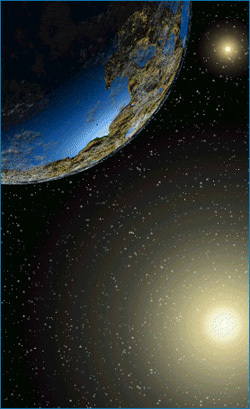 An artist's conception of a terrestrial planet in the star system Alpha Centauri. Image by Mark Fisher. A rocky planet similar to Earth may be orbiting one of our nearest stellar neighbors and could be detected using existing techniques, according to a new study led by astronomers at the University of California, Santa Cruz. The closest stars to our Sun are in the three-star system called Alpha Centauri, a popular destination for interstellar travel in works of science fiction. UCSC graduate student Javiera Guedes used computer simulations of planet formation to show that terrestrial planets are likely to have formed around the star Alpha Centauri B and to be orbiting in the "habitable zone" where liquid water can exist on the planet's surface. The researchers then showed that such planets could be observed using a dedicated telescope. "If they exist, we can observe them," said Guedes, who is the first author of a paper describing the new findings. The paper has been accepted for publication by the Astrophysical Journal. Coauthor Gregory Laughlin, professor of astronomy and astrophysics at UCSC, said a number of factors converge to make Alpha Centauri B an excellent candidate for finding terrestrial planets. The Doppler detection method, which has revealed the majority of the 228 known extrasolar planets, measures shifts in the light from a star to detect the tiny wobble induced by the gravitational tug of an orbiting planet. Factors that favor the use of this technique for Alpha Centauri B include the brightness of the star and its position in the sky, which gives it a long period of observability each year from the Southern Hemisphere, Laughlin said. Detecting small, rocky planets the size of Earth is challenging, however, because they induce a relatively small wobble in their host stars. According to Laughlin, five years of observations using a dedicated telescope would be needed to detect an Earth-like planet around Alpha Centauri B.
Coauthor Debra Fischer of San Francisco State University is leading an observational program to intensively monitor Alpha Centauri using the 1.5-meter telescope at the Cerro Tololo Inter-American Observatory in Chile. The researchers hope to detect real planets similar to the ones that emerged in the computer simulations. To study planet formation around Alpha Centauri B, the team ran repeated computer simulations, evolving the system for the equivalent of 200 million years each time. Because of variations in the initial conditions, each simulation led to the formation of a different planetary system. In every case, however, a system of multiple planets evolved with at least one planet about the size of Earth. In many cases, the simulated planets had orbits lying within the habitable zone of the star. In addition to Guedes, Laughlin, and Fischer, the authors of the paper include UCSC postdoctoral researcher Eugenio Rivera and graduate student Erica Davis, and Elisa Quintana of the SETI Institute. This research was supported by NASA and the National Science Foundation. Note to reporters: You may contact Guedes at (831) 459-2774 or javiera@ucolick.org; Laughlin at (831) 459-3208 or laughlin@ucolick.org; and Fischer at (415) 338-1697 or fischer@stars.sfsu.edu.